Electronic procurement is focused on the automation of procurement and supply processes via web based applications. Applying e-procurement software ensures transparency, accountability, and efficiency of the procurement process. Moreover, it reduces costs and time without compromising on standards and quality of provided services. Quintagroup has extensive experience in development and implementation of the e-procurement software. A fully integrated comprehensive e-procurement solution will improve performance and efficiency of organisations and this, in turn, will increase organisations’ profitability. 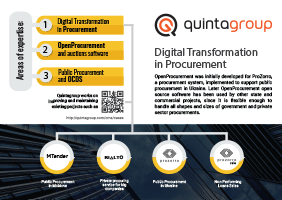 OpenProcurement is an open source e-procurement toolkit developed by Quintagroup. It provides the tools to design and build efficient procurement / purchasing processes. OpenProcurement toolkit contains e-Auction module that manages auction stage of the procurement. Detailed overview of the OpenProcurement solution. 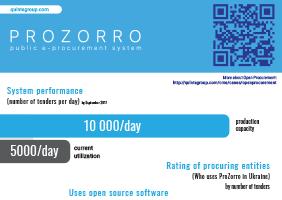 OpenProcurement was applied in Prozorro that is Ukrainian tender process reform of electronic public and state procurements that introduced e-procurement system. 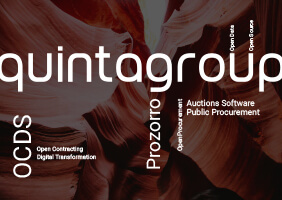 OpenProcurement was applied in in Prozorro.sale that is a Deposit Guarantee Fund (DGF) system that organizes sale of the property (assets), belonging to insolvent or liquidated banks. NPL (non-performing loans) are called the bank loans that have not been repaid by the borrower for 90 days or are considered unlikely to be repaid due to certain reasons. Owing to financial crisis and recessions a number of banks appear to be left with very high levels of NPLs. As a result, this may be the source of market failure, affecting the investment rate as well as the economy overall. The principles of the ProZorro public e-procurement system laid the foundation for Rialto, "the commercial ProZorro". Open Contracting Data Standard was incorporated in the ProZorro system's core - OpenProcurement toolkit. Coopetition approach offers a new centralized and efficient solution by introducing cooperation among marketplaces. Open ProcurementThe open procurement method requires procurements to be open to all qualified and interested bidders, be appropriately advertised, have objective qualifications criteria, and be awarded to the least-cost provider without contract negotiations.